Izumo is a quaint little town located on the other side of Lake Shinji from Matsue. It is more famous than Matsue due to Izumo Taisha, Izumo soba, and Iwami Ginzan. The city itself is very small with only a few things to do within the city. Like most of the cities in the San’in region (Tottori and Shimane), many of the shops close at 5pm. You can always find good food at most times of the night, but if you are looking to do sight seeing, or looking for fun, you will be out of luck most of the time. I would highly recommend at least a day, but two or three is best in order to take advantage of all the great things in the area. By far, the most important place to visit in Izumo has to be Izumo Taisha. It is a historical shrine and said to be the oldest in Japan. 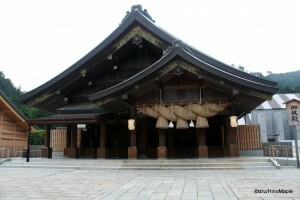 Some origin stories claim that the god that lives in Izumo Taisha is the god that built Japan. I have also heard that every year, the other gods visit Izumo Taisha, but unfortunately, I’m not sure as to the reason for this. The main reason people visit Izumo Taisha is because they wish to find their life partner. The shrine is well known for being a place where, if you pray to the gods, you will continue to be with your partner, or you will find your life partner soon. This is especially true for people having a tough time finding someone, or for newlyweds. Many couples also get married in Izumo Taisha due to the relation to the resident god who happens to be a god for relationships. Unfortunately, when I visited, the main shrine was under reconstruction, so all I could see was a large steel house that protected the workers as they rebuilt the shrine. While not being able to see the main shrine is a problem, the gardens around the shrine are very nice and the Kaguraden, which is next to the main shrine, is more famous than the shrine itself. 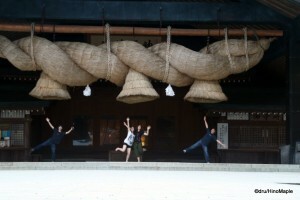 At this building, you will find the largest religious rope in Japan. As with all other buildings in the complex, most people pray for their relationships. The rope itself is a place to pray. If you take a coin, the goal is to throw it into the rope. If the coin gets stuck in the rope, you will have good luck. Don’t forget to make a wish and pray. It’s similar to tossing a coin into a fountain, but much harder as your coin will more than likely come back at you, or other coins will also come back at you. A short drive out from Izumo Taisha is Hinomisaki. This is a small cape that is famous for its lighthouse and shrine. 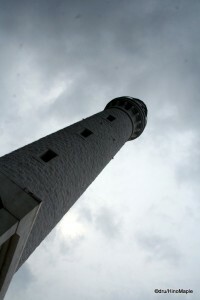 It is home to the Hinomisaki Lighthouse, the tallest stone lighthouse in East Asia. The light house itself is not particularly spectacular, but the views of the Sea of Japan are. A climb to the top of Hinomisaki is a must, but be aware that the hike to the top is not easy. There are over 150 steps to the top, and they are all steep. Like any lighthouse, there isn’t anything special at the top. The only special thing would be to see what a modern light house looks like, and to get a little information on how they work. Unfortunately, the information is all in Japanese. 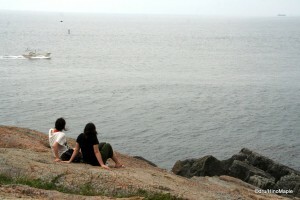 The best thing to do, while in the area is to explore the shore. There is a large park connecting Hinomisaki village with the lighthouse, but venturing a little north of the lighthouse will take you to Izumo-Matsushima. The rocky cliffs on the way from the lighthouse towards Izumo-Matsushima are great for exploring and taking various photos. You could spend hours just walking along the rocks, and there are a few places where you can enjoy a great swim. When the rock cliff ends, and the forest trail begins, you will be able to see Izumo-Matsushima. It is called Izumo-Matsushima due to it’s similarities with Matsushima near Sendai. While there aren’t many rock island formations, there are a few, and it wasn’t as disappointing as Matsushima. I would recommend a short walk out this way to enjoy the peace and quiet. It’s great for an hour of relaxing. On the way back to the parking lot, you can also stop by some of the shops. It was a little strange, but there are a lot of blowfish skins that can be bought. I didn’t bother to buy them, but it was available for purchase, but I was a little scared of what it might do to me as we travelled. Hinomisaki village is a small area next to the lighthouse. When leaving the lighthouse, turn left at the first set of lights and you’ll be in the village. It’s famous, mainly, for Hinomisaki Shrine. It’s a typical red coloured shrine that is nestled into the hillside. A little further from the town, towards Izumo Taisha, there is a hotel located on a Cliffside. It’s a little scary as it has been abandoned. It is said to be haunted, which makes Hinomisaki feel slightly haunted. It might have been due to the time, the clouds, and the story of a haunted hotel, but the shrine was very spooky. It didn’t help that when I visited Hinomisaki Shrine, it was getting a little dark, only a few people were there, and some of the smaller shrines were in the forested hills. Those smaller shrines were nestled into the forest creating a dark and eerie feel that I may not forget. That aside, the shrine wasn’t all that spectacular, but if you are in the area, it’s worth a quick stop. Once you finish with the shrine, you should walk out to the pier. At the pier, you’ll be able to see Fumishima. It is a small island that’s very close to the coast. Depending on the time of year, November to July, you’ll be able to see thousands of black tailed gulls. They are a protected species, and the island is off limits to everyone except the priest of Hinomisaki Shrine. 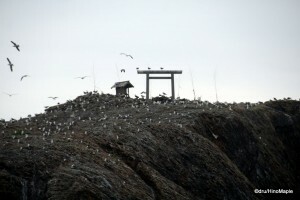 The birds are very noisy and a little messy, but the sight of thousands of birds hanging around a very small shrine and a single wooden torii is interesting. If you are too lazy to drive over from the lighthouse, or vice versa, it’s a short walk along the coast between Hinomisaki village and the lighthouse. While you are in the Izumo area, it’s recommended that you visit an onsen. In Izumo, and neighbouring Hikawa Town, you can visit many onsen. Lake Shinji is well known for its onsen hot springs. While you can visit many onsen all around the lake, the onsen in and around Izumo are easy to reach. The easiest onsen to visit would have to be Lamp Onsen. 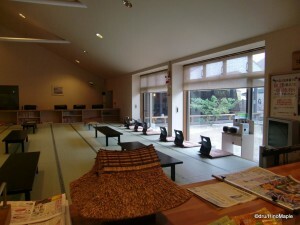 It’s a small onsen located on the south side of Izumoshi Station, and relatively cheap. The name comes from the fact that they use oil lamps inside the onsen for lighting. It’s a great small place to go and relax for an entire afternoon. There isn’t too much to do there aside from bathe, but the water is great. The numbers of baths are small, so there is little chance of making a mistake. Another unique aspect to this onsen is the fact that it has reddish brown water, probably due to the clay or earth from which they get their water. I would also recommend a small onsen called Yurari, which is located north of the Izumo airport. This onsen is not as nice as Lamp, but it had more baths, a large resting area, and a few restaurants. Unfortunately, it did feel a little sterile due to the more modern nature. If you want a unique feel, Lamp would be your best bet. Izumo is a great place to visit. If you combine it with a trip to Matsue and Iwami Ginzan, it would be a great week. While you don’t truly need a week to see and do everything, running around as fast as you can, in the countryside is not always ideal. If you want to be more like a local, take things slow and absorb the energy each area has to offer. This entry was posted in Chugoku and tagged blowfish, fugu, Fumishima, Hikawa, Hikawa Town, Hinomisaki, Hinomisaki Jinja, Hinomisaki lighthouse, Hinomisaki Shrine, Hinomisakijinja, Iwami Ginzan, Izumo, Izumo Airport, Izumo soba, Izumo Taisha, Izumo-Matsushima, japan, Kaguraden, Lake Shinji, Matsue, Matsushima, San'in, Sendai, Shimane, Shinjiko, Shinjinoko, そば, ふぐ, 仙台, 出雲, 出雲そば, 出雲大社, 出雲松島, 島根, 日御碕, 日御碕神社, 日本, 松島, 松枝, 氷川, 氷川町, 石見銀山, 踏み島 by Dru. Bookmark the permalink.